Anyone with an interest in woodworking will want to take classes to learn it. While it is possible for people to pick up a piece of wood and learn the hard way, learning from a class will help people learn the right techniques. Classes will provide people with feedback when they practice what they’ve learned, and they can see what mistakes they’ve made and correct them. 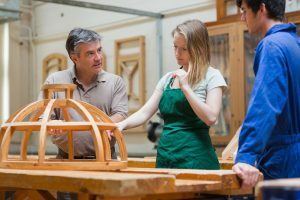 The following options should be considered for anyone that wants to take woodworking classes. Sometimes, home improvement stores will offer classes on woodworking. These classes are perfect for beginners because the teachers will go over the basics from the beginning and the groups are usually small enough that they can work more closely with students. These classes are usually offered on the weekends, when students have more free time to attend them. The best thing about these classes is that they’re usually free. It’s possible to take online classes for most things and woodworking is no exception. Thanks to the ability to chat and stream video through the internet, people have begun to offer classes where they can teach woodworking and interact with students that are even in different countries. The students can also chat with each other through open forums and chat rooms for extra help. Many of these classes come with flexible schedules that will fit best with the students’ lifestyle. The downside of theses classes is that the students must provide their own tools and materials, which can make things a little pricey if they don’t already have them. Some community colleges also offer woodworking classes for those who are interested. These classes can be taken for a grade with credits if desired, but most people will probably opt to take them at just a pass/fail level. The teachers of these classes have been teaching students for years and are used to working with beginners to get the best level of performance out of them. Generally students will have to pay for these classes, but they can offer the best results. There are schools that give classes specifically on woodworking and nothing else. Usually people enter these classes with the intention of becoming a master in the craft of woodworking, but beginners can still benefit from them as well. Depending on the school, these classes can be the most expensive option for learning about woodworking, but since the teachers are experts, they can produce the best results with their students. The teachers will also have some of the best personal interactivity with students out of any of the learning options. There is also the possibility of learning woodworking through instructional video classes. These classes offer no interactivity or feedback during the learning process, but a lot of valuable information can be obtained from them. DVDs can be purchased, but most videos can also be found online for free. Whether it is in person or through a virtual setting, a woodworking class can help anyone go from novice to an expert that can make the most creative things out of wood. More expensive class options will provide a more in depth level of learning, but that doesn’t the mean the free options should be disregarded.